Alumni from the Operations and Supply Chain Management Program have positions of responsibility in companies around the globe. 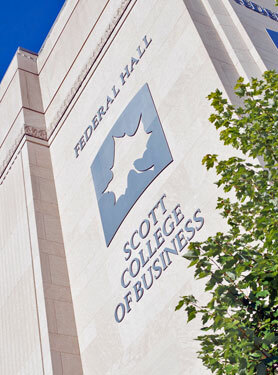 They remain committed to the success of the program and frequently offer their time and expertise through our Scott College of Business Advisory Boards. Corp of Ohio. He travels frequently to Crown’s locations around the world and contributes to the future of the company through innovation, product development, and customer support. Keith graduated from ISU with an Operations and Supply Chain Management degree in 2000. In 2005 he was honored by Indiana State as a recipient of the GOLD (Graduates of the Last Decade) Award. He is currently a member of the Scott College Young Professionals Board. Krist Hughes is Logistics Center Manager for Caterpillar Logistics Services, Inc. in South Carolina. She was formerly global account manager and Six- Sigma/CPS (Caterpillar Production System) Black Belt in Manufacturing Logistics for Caterpillar. She led teams in the use of SixSigma and LEAN tools to reduce waste in material handling and distribution processes. She has worked in several positions for Caterpillar including Server Administration, Data Center Planning and Logistics Operations. She graduated from ISU in 1997 with a double major in Operations and Supply Chain Management and Management Information Systems.